The Toxoplasma protozoan parasite is not only a hazard for pregnant women, few are aware of how it also affects the behavior of mice. Infected mice actually seem to lose their fear of cats, which is not only beneficial to felines, whom receive an easy meal, but allows the parasite to complete its life cycle within the cat's gut. The mind altering effects appear to be permanent and persist long after the mouse has recovered from the initial onset of toxoplasmosis. This appears to be true even when the parasites cysts are not present in the brain, indicating that a permanent change has been made. 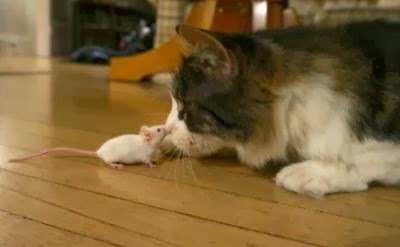 Wendy Ingram at the University of California, Berkeley speculates that the section of the brain responsible for smell has been damaged, meaning mice can no longer sense cat urine. The research is particularly interesting because it's believed that up to one-third of the world's population has been exposed to the Toxoplasma parasite. A healthy immune system will keep the dormant cysts under control for most, but immunocompromised individuals may have health concerns. There is even reason to believe that chronic infection is linked to schizophrenia and suicidal behavior. Oh! I did not know about this toxoplasma , It is intersting . I liked reading this post. It was very informative . We must have more such post so that we become aware of many biological things.